Materials—especially outdoor fabric—can quickly become worn out or dirty if not cared for properly. When water lands on fabrics they can begin to attract mold, mildew, dirt, and stains. Keep your materials clean and fresh by regularly using a water repellent and upholstery protector on them. Fabric protectants and water repellents can help your materials look as good as when you first purchased them. HOW DO YOU KNOW IF YOUR ITEM IS WATER REPELLENT? The best way to test a materials water repellency is to apply water to a small test patch. Using an eyedropper, add a few drops of water to your material. 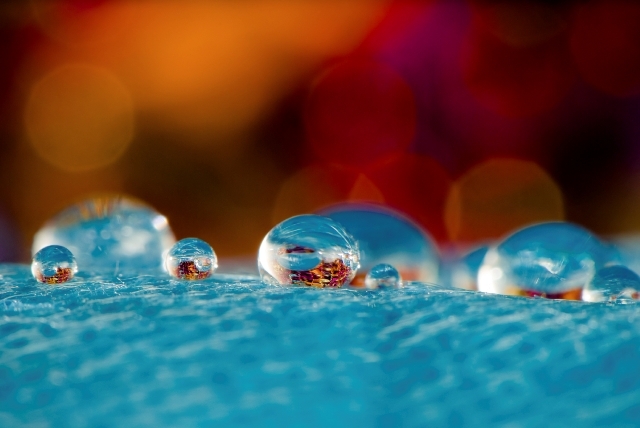 If the water beads up on the material, it has been treated with a water repellent. If the material absorbs the water, it needs to be treated with a fabric guard. Next, shake the fabric a little. If the fabric is water repellent, the water should fly off the material. If the water completely soaks into the material, turning it a darker shade, then it is most likely not treated. HOW CAN YOU TELL IF YOUR MATERIAL NEEDS TO BE RETREATED? Water repellents can lose their potency and effectiveness over time. If you find mold or mildew growing on your material, it most likely needs to be retreated. Make sure to completely clean the mold or mildew from your material and let dry before reapplying a coat of repellent. If you find your material’s color is fading, or stains are penetrating the material more easily, you should retreat the material. If you use or wash your materials more than usual, you might need to apply a guard sooner. Simply repeat the water test every month or so to ensure your materials are getting the protection they need. Every material is different and you might need to test the material sooner if you find your materials are beginning to absorb water. It is the only product recommended by leading outdoor fabric manufacturer, Sunbrella to restore lost water repellency. After being treated with 303® Fabric Guard, materials will repel water as well as most oil and water-based stains. They will also maintain their breathability and keep their soft texture. Once the material is clean, allow it to air-dry. Once the material is completely dry, spray 303® Fabric Guard onto the surface until damp, overlapping sprayed areas in a crisscross pattern. Make sure not to over-saturate. For best results, treat in warm weather: 70°F or higher. 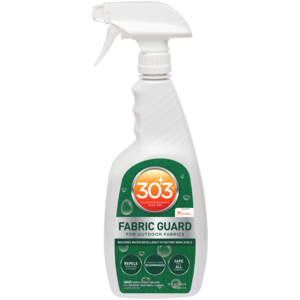 Make sure you are in a well-ventilated area when applying 303® Fabric Guard to your materials. Allow the treated fabric to dry (cure) for 6-24 hours in a clean, dry environment before using. Keeping your fabric clean by brushing off dirt and cleaning spills immediately will help the longevity of the item. none of the Auto store stock your auto products!!!! My convertible top looks great!!! That’s great! All of our products are also available online if you are having trouble finding them in store.